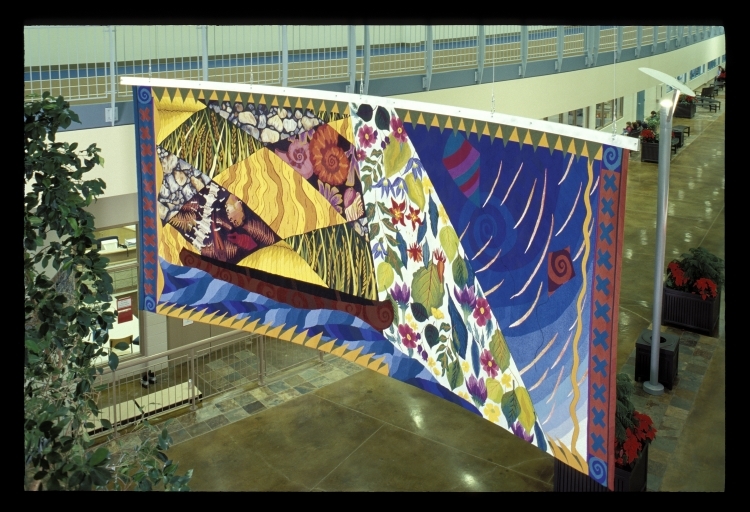 The Tapestry 'Parkland' hangs in the east entranceway of the Collicutt Centre in Red Deer, Alberta. The tapestry hangs in a gentle curve, repeating the half circular form of the vestibule area and is finished on both sides so the image could be viewed on entering or exiting the building. As in most of my tapestry designs my approach in the 'Parkland' design is somewhat abstract. I reference recognizable images, but develop the images more as symbols and motifs that emphasis pattern and decorative qualities. The composition for 'Parkland' consists of three interior fields of activity - a spiraling windswept sky area with two flying kite forms, a cascade of parkland flower and leave forms falling through a shaft of light and a patchwork of land images that reflect the central Alberta environment (river stones and gravel beds, cultivated fields, grasslands and fossil remains that reference the geological history and wealth of the area). A stylized image of the river runs across the lower section of the composition, propelling a canoe across the picture plan. The tapestry 'Parkland' was designed to reflect the richness of the natural environment in the Red Deer area and to celebrate man's physical and spiritual links to the natural environment.